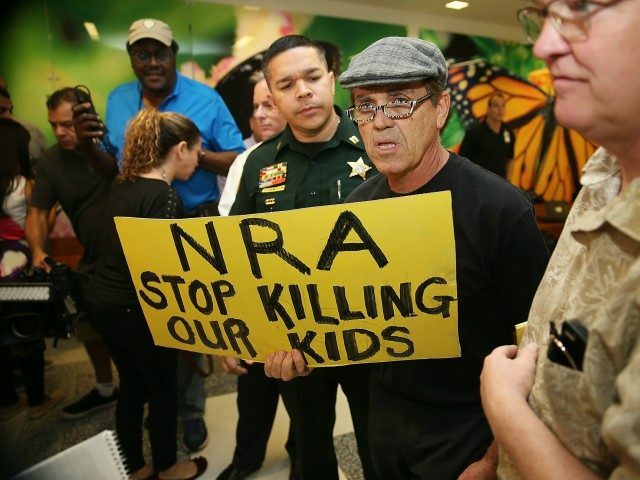 In the wake of the Parkland school shooting massacre, and in order to deflect away from the only answer to this contagion of school shootings (which of course is hardening school security), our media and the left in general have to manufacture one stupid-hour after another in order to keep the focus on gun-grabbing. The results of this cynical and desperate crusade have not only exposed these provincial elites as completely opposed to keeping our children safe, but as liars, and morons. CNN “expert” Tom Fuentes says we should not arm trained and qualified teachers because most teachers are girls and girls can’t conceal a gun when they dress like girls. MSNBC’s Lawrence O’Donnell figured out that it is dumb to arm qualified school personnel because the bullet from an AR-15 travels three times faster than the bullet from a concealed pistol. This speed difference gives the killer plenty of time to get off his shot and to move out of the way of the bullet you fired because The Matrix is real, y’all. It is so odd that no one watches CNN. Those of you not old enough to remember when the Weekly Standard was a conservative publication will not be surprised by this, but everyone’s favorite cruise sponsors have now sided with MSNBC on the issue of arming trained and qualified teachers. States and municipalities may wish to try different policies, but arming so many teachers across the nation would increase the danger, not alleviate it. School shootings are a problem, but the odds of any one school being attacked is still, thankfully, minuscule. Put a gun in the classroom, and it might well become like Chekhov’s gun: Eventually, somebody’s going to use it. Odd, how in this quest to seek approval from the elite media, the Weekly Standard fails to mention those school districts that already allow concealed carry … and have for years … without incident. Jake Tapper indignantly says no it wasn’t and the transcript proves it! This is so dishonest. The student said her question was for Dana. That’s why I said that. Read the transcript. Okay, so here’s the transcript — which clearly shows that because Dana Loesch was not available, the student chose instead to ask a Democrat an uncomfortable question, which Tapper jumped in to ensure didn’t happen. Yep, not scripted AT ALL. Another reminder that Democrats are incapable of shame. Vice Media: Like, OMG, Women Might Be Able to Defend Themselves! Vice Media is freaking out over the idea that women might carry guns. “[C]ivilians don’t understand [that] in close quarters the first thing you are going to have to experience is the explosive sound of the weapon going off, not yours but the shooters,” the Expert expertsplained. Where does our media find people willing to sacrifice their integrity on the altar of ideology like this? You are going to hear the gunshot, regardless. So the noise of the gun has nothing to do with anything. The question is would you rather hear the gun while trembling under a desk waiting to die like an animal, or like a human being on your feet and fighting back? David Hogg frequently uses the argument that eventually his side will win the gun control debate because those of us who do not want to give up our Second Amendment right will eventually die off, leaving the young and dumb to take over the world. The only problem with this reasoning is that as people grow older, wiser, and more experienced, they overwhelmingly vote conservative — which means that in 25 years, Hogg’s generation will become conservative. CNN’s Alisyn Camerota: You Gunna Believe Me or the Lying Videotape? The dumb brother strikes again. After the cold medicine comparison was debunked, CBS News switched to anti-diarrhea medicine, which is still a lie. I couldn’t tell if Boehlert was drunk or applying for a job with CNN.